Gary McGraw describes several best practices for building secure software. One is the use of so-called abuse cases. Since his chapter on abuse cases left me hungry for more information, this post examines additional literature on the subject and how to fit abuse cases into a Security Development Lifecycle (SDL). Abuse cases are an adaptation of use cases, abstract episodes of interaction between a system and its environment. A use case consists of a number of related scenarios. A scenario is a description of a specific interaction between the system and particular actors. Each use case has a main success scenario and some additional scenarios to cover variations and exceptional cases. Actors are external agents, and can be either human or non-human. For better understanding, each use case should state the goal that the primary actor is working towards. 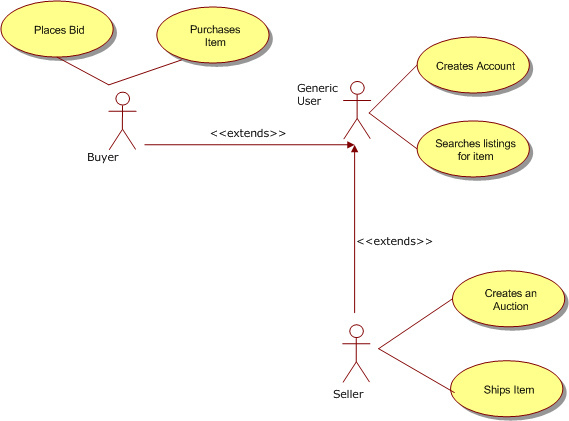 Use cases are represented in UML diagrams (see example on left) as ovals that are connected to stick figures, which represent the actors. Use case diagrams are accompanied by textual use case descriptions that explain how the actors and the system interact. An abuse case is a use case where the results of the interaction are harmful to the system, one of the actors, or one of the stakeholders in the system. An interaction is harmful if it decreases the security (confidentiality, integrity, or availability) of the system. Abuse cases are also referred to as misuse cases, although some people maintain they’re different. I think the two concepts are too similar to treat differently, so whenever I write “abuse case”, it refers to “misuse case” as well. Some actors in regular use cases may also act as attacker in an abuse case (e.g. in the case of an insider threat). We should then introduce a new actor to avoid confusion (potentially using inheritance). This is consistent with the best practice of having actors represent roles rather than actual users. Attackers are described in more detail than regular actors, to make it easier to look at the system from their point of view. Their description should include the resources at their disposal, their skills, and their objectives. Note that objectives are longer term than the (ab)use case’s goal. For instance, the attacker’s goal for an abuse case may be to gain root privileges on a certain server, while her objective may be industrial espionage. Abuse cases are very different from use cases in one respect: while we know how the actor in a use case achieves her goal, we don’t know precisely how an attacker will break the system’s security. If we would, we would fix the vulnerability! Therefore, abuse case scenarios describe interactions less precisely than regular use case scenarios. Note that since actors in use cases needn’t be human, we can employ a similar approach to abuse cases with actors like “network failure” etc. to model non-functional requirements beyond security, like reliability, portability, maintainability, etc. For this to work, one must be able to express the non-functional requirement as an interactive scenario. I won’t go into this topic any further in this post. Abuse case models are best created when use cases are: during requirements gathering. It’s easiest to define the abuse cases after the regular use cases are identified (or even defined). Abuse case modeling requires one to wear a black hat. Therefore, it makes sense to invite people with black hat capabilities, like testers and network operators or administrators to the table. The first step in developing abuse cases is to find the actors. As stated before, every actor in a regular use case can potentially be turned into an malicious actor in an abuse case. We should next add actors for different kinds of intruders. These are distinguished based on their resources and skills. When we have the actors, we can identify the abuse cases by determining how they might interact with the system. We might identify such malicious interactions by combining the regular use cases with attack patterns. We can find more abuse cases by combining them systematically and recursively with regular use cases. Some people keep use cases and abuse cases separate to avoid confusion. Others combine them, but display abuse cases as inverted use cases (i.e. black ovals with white text, and actors with black heads). The latter approach makes it possible to relate abuse cases to use cases using UML associations. For instance, an abuse case may threaten a use case, while a use case might mitigate an abuse case. The latter use case is also referred to as a security use case. Security use cases usually deal with security features. Security use cases can be threatened by new abuse cases, for which we can find new security use cases to mitigate, etc. etc. In this way, a “game” of play and counterplay enfolds that fits well in a defense in depth strategy. We should not expect to win this “game”. Instead, we should make a good trade-off between security requirements and other aspects of the system, like usability and development cost. Ideally, these trade-offs are made clearly visible to stakeholders by using a good risk management framework. Use cases can be abstracted into essential use cases to make them more reusable. There is no reason we couldn’t do the same with abuse cases and security use cases. It seems to me that this not just possible, but already done. Microsoft’s STRIDE model contains generalized threats, and its SDL Threat Modeling tool automatically identifies which of those are applicable to your situation. Although abuse cases are a bit different from regular use cases, their main value is that they present information about security risks in a format that may already be familiar to the stakeholders of the software development process. Developers in particular are likely to know them. This should make it easier for people with little or no security background to start thinking about securing their systems and how to trade-off security and functionality. However, it seems that threat modeling gives the same advantages as abuse cases. Since threat modeling is supported by tools, it’s little wonder that people prefer that over abuse cases for inclusion in their Security Development Lifecycle. I’ve been interested in this since reading Software Security by Gary McGRAW when it first came out. It’s amazing how little has been written on this and applying to an Agile development environment with user stories. I’m pleased that you’re referencing a term paper written by one of my former students. And I agree with you: there’s no clear distinction in the literature between abuse cases and misuse cases. A complete security analysis is impossible, I’d insist, unless you also consider the *non-performance* of required tasks by insiders, e.g. updating antivirus software, notifying appropriate parties if misuse, abuse, or confuse cases are detected. But I don’t have a cute name for these cases… suggestions anyone?